Is human activity warming the Earth or do recent signs of climate change signal natural variations? In this feature article, scientists discuss the vexing ambiguities of our planet's complex and unwieldy climate. October 20, 2000 -- Newspaper headlines trumpet record-breaking temperatures, dwindling sea ice, and retreating glaciers around the world. Concentrations of atmospheric carbon dioxide, one of the greenhouse gases responsible for scalding temperatures on Venus and at least 33 degrees C of normal warming here on Earth, are on the rise. Our planet seems destined for a hot future! But is it really? Or are we simply experiencing a natural variation in Earth's climate cycles that will return to "normal" in time? Correlations between rising CO2 levels and global surface temperatures suggest that our planet is on a one-way warming trend triggered by human activity. Indeed, studies by paleoclimatologists reveal that natural variability caused by changes in the Sun and volcanic eruptions can largely explain deviations in global temperature from 1000 AD until 1850 AD, near the beginning of the Industrial Era. After that, the best models require a human-induced greenhouse effect. In spite of what may seem persuasive evidence, many scientists are nonetheless skeptical. They argue that natural variations in climate are considerable and not well understood. The Earth has gone through warming periods before without human influence, they note. And not all of the evidence supports global warming. Air temperatures in the lower atmosphere have not increased appreciably, according to satellite data, and the sea ice around Antarctica has actually been growing for the last 20 years. It may surprise many people that science -- the de facto source of dependable knowledge about the natural world -- cannot deliver an unqualified, unanimous answer about something as important as climate change. Why is the question so thorny? The reason, say experts, is that Earth's climate is complex and chaotic. It's so unwieldy that researchers simply can't conduct experiments to check their ideas in the usual way of science. They often rely, instead, on computer models. But such models are only as good as their inputs and programming, and today's computer models are known to be imperfect. Most scientists agree that no single piece of data will likely resolve the global warming debate. In the end, the best we can expect is a scientific consensus based on a preponderance of evidence. The recent discovery that Greenland's ice sheet is thinning is a good example of our climate's sometimes vexing ambiguity. About 85 percent of Greenland is covered by a massive ice sheet with an area of about 1,736,000 square kilometers and an average thickness of about 1,500 meters. The volume of ice in the Greenland sheet is estimated to be about 2,600,000 cubic kilometers -- enough ice to raise sea levels by 6.4 meters if it all were to melt. While it is only about one-seventh the size of the Antarctic ice sheet, some scientists think that watching the ice on Greenland provides better clues about global warming. "Even though Antarctica is seven times the size of Greenland, because (Antarctica is) kind of symmetrically positioned around the South Pole, it doesn't really interact with climate up in the more temperate regions the way Greenland does," said Dr. William Krabill at NASA's Wallops Flight Facility. Krabill is the project scientist for the team that discovered the thinning. "Greenland ... is likely to be a better indicator of global climate change than Antarctica," he noted. Krabill's team used an airborne laser to survey the altitude of the ice sheet's surface during 1993 and 1994. They repeated their survey in 1998 and 1999, making certain to retrace their flight paths from the first survey as closely as possible. After incorporating some assumptions that let them extend their measurements to the sheet's edges, the scientists compared the second survey to the first. They found that the ice sheet's surface was slightly higher at the center but considerably lower at the edges -- particularly the southeastern edge. The overall result: The ice sheet lost at least 51 cubic kilometers of volume during that five year period. 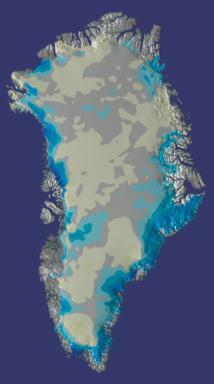 Greenland appeared to be melting! Many newspaper headlines cried the discovery as a sign of global warming -- which most readers presumably took to mean "anthropogenic," or human-caused, global warming. But is that the right conclusion? "What you can say is, yes, carbon dioxide (in the atmosphere) is at levels higher than ever before, and carbon dioxide is a greenhouse gas, so it's reasonable to say that there's warming associated with the increase of carbon dioxide," said Dr. Waleed Abdalati, co-author of the paper that announced the Greenland discovery. "But you can't make the leap yet that all the cars in the world have led to what we're observing in the thinning of the Greenland ice sheet," Abdalati said. Left: A graph showing the Earth's average global surface temperature from 1880 to the late 1990s. The black dotted line follows the averages for each year and the red line traces the five-year average. There is a clear upward trend over that time. If there's one lesson to be learned from science, it's that things are usually much more complex than they at first appear. The warming trend of the last century may seem to be the obvious explanation for the thinning seen on Greenland, but scientists are considering other possibilities. "That's what science is about," said Dr. Ellen Mosley-Thompson, a research scientist at the Byrd Polar Research Center at The Ohio State University. "Just because you have an hypothesis and immediately your experiment produces support for it, you can't simply accept those results (without a degree of skepticism)," Mosley-Thompson said. "The whole idea is to play devil's advocate on your own research before your colleagues do." Last century's warming trend is not the only possible explanation for the thinning that Krabill's team saw on Greenland. In fact, ice cores taken as part of another NASA-funded study suggest that natural variation in snowfall may be partly to blame, Mosley-Thompson said. "The ice core data provide evidence -- not necessarily conclusive -- that Bill's results may in part reflect variability in snow accumulation over his five-year observational window," said Mosley-Thompson, who co-authored the paper reporting these results with Dr. Joseph McConnell, an associate research professor at The Desert Research Institute in Reno, Nevada. The results of the study were published in the August 24 edition of the journal Nature. Other natural processes could account for the thinning as well. Ocean currents might have caused part of the change. Or the flux of warm water into the North Atlantic caused by the 1990-1996 positive phase of the slow-moving North Atlantic Oscillation could have had an influence. The ice sheet could also be thinning in response to the long-term warming of the planet since the transition from the last glacial period about 10,000 years ago. Krabill, Dr. Ron Kwok of NASA's Jet Propulsion Laboratory, and Abdalati mentioned these scenerios during interviews with Science@NASA. Scientists often refer to these alternate explanations under the umbrella term of "natural variability." "For the ordinary person, it's a common misperception that weather is not changing ... that last winter is about as cold as this winter and last summer is about as warm ... and the world is pretty much constant," Krabill said. "That's not true. The Earth has gone through and continues to go through cycles of warming and cooling. It's just natural." This natural variability often shows an astounding degree of complexity, much of which remains poorly understood. "We've only begun making (large scale) measurements in the last 100 to 150 years," Abdalati said. "And climatic processes happen on very different time scales. There are some, like ice ages, that are in the tens of thousands or hundreds of thousands of years long. An then there are atmospheric processes like weather, which happen on the scales of hours and days." Other climate cycles fall in between, such as the North Atlantic Oscillation mentioned above, which is thought to complete one cycle roughly every 20 to 30 years. "And so you have all these processes mixed together that have been going on for thousands of years, and you're in the difficult position of trying to separate something very recent from the natural cycle without fully understanding what that natural cycle is," Abdalati said. Left: Knowing where a relatively short interval of observation fits into the long-term pattern is a difficult challenge for scientists. A steady increase that appears to be a trend may be a trend, but it may also be a small part of a larger cycle. Observing a system like climate that varies on several time scales -- some of which approach geological slowness -- could be likened to an ant watching the hands of a clock, "perhaps with the ant sitting on the hour hand," Abdalati added. Seen in this context, scientists don't give much weight to the five-year snapshot of the ice on Greenland. "You know, five years is a pretty short amount of time in glaciological terms," Krabill said. "To try to make inferences about 'Global Climate Change' in capital letters from a five-year period of time is a pretty risky business." Other modern data sets are not much longer. The era of satellite observation is only about 30 to 40 years old -- a mere blink in climatological terms. And the widespread network of weather-measurement stations in the developed world is about 150 years old. Greater insight about the role of natural variability may come from the field of paleoclimatology -- a specialized branch of climatology that uses scientific sleuthing to summon the ghost of climates past. The "fingerprints" of Earth's climate hundreds or even thousands of years ago remain imprinted in the rings of temperature-sensitive trees, the chemicals trapped in ancient ice, and the layers of sediment on the ocean floor. Several studies by paleoclimatologists have suggested that natural variability can't fully explain the warming of the last century. For example, Dr. Thomas J. Crowley, a geologist at Texas A&M University, used similar techniques to reconstruct basic climate data -- such as average global temperature -- back to 1000 A.D.
Crowley examined natural climate variations in a simple computer climate model caused by two external influences: fluctuations in the sun's intensity and aerosols injected into the atmosphere by volcanoes. He deduced the history of solar flux from concentrations of carbon-14 in tree rings and of beryllium-10 in ice cores. Then, he deciphered past volcanic activity from sulfate aerosol deposits in ice cores. Crowley ran the computer climate model with the solar and volcanic forcing terms, then compared the average temperatures it produced with a temperature record constructed from tree-ring data. Despite the relative simplicity of his model, Crowley found good agreement between the temperature fluctuations it calculated for the years 1000 AD to 1850 AD and the fluctuations actually measured from tree rings during that interval. Over that 850-year period, fluctuations in solar intensity along with volcanic eruptions could account for roughly 50 percent of the variation seen in the tree-ring record -- give or take 10 percent. Something happened, however, after 1850. Crowley's model could only account for about 25 percent of the observed temperature changes. Something else was needed -- volcanic eruptions and solar variability were not enough. Crowley then introduced a human-triggered greenhouse effect to the model and it produced a much better match. "It all comes out as indicating that you can't resort to (natural variability) to explain the recent warming," Crowley said. "The (recent) warming is consistent with a greenhouse effect but inconsistent with any explanation from natural variability." So with the weight of a 1,000-year climate record on human shoulders, can scientists finally say that they've proven humanity is causing an unnatural warming of the globe? "The time series we developed is statistically significant -- highly significant," Crowley said. "That doesn't prove something is right, but it still makes a good case that we're on the right track." The problem with the "P" word --Proof! From a statistical point of view, no single scientific result based on real-life data ever deserves absolute confidence. There always lingers the possibility -- however small -- that the apparent results are due to chance patterns in the data, i.e., "noise." In the case of Crowley's study, statistical tests show that the probability of his results being due to chance is less than 1 percent. Usually, anything less than 5 percent is considered credible. "This is not mathematics where you can prove something and write Q.E.D. at the bottom of the page," Crowley said. "This is geoscience. It's a dirtier field, and usually you make statistical arguments." The abbreviation stands for the Latin phrase quod erat demonstrandum, which means, "which was to be demonstrated." Mathematicians use "Q.E.D." to indicate the end of the written proof of a theorem, which, if correct, is considered absolute. Above: The general trend of average global temperatures from Precambrian time -- when multicellular organisms first evolved -- to the present. Notice that average global temperatures vary by roughly 10 degrees Celsius between warm and cool periods. Image courtesy of Dr. Chris Scotese. In addition to the caveats inherent to statistics, conclusions from studies like Crowley's that are based on computer simulations of the world's climate are plagued by questions of how well computer models portray the real thing. To prove causation, scientists must perform experiments under controlled conditions on the system being studied, manipulating the system to understand what causes what. Other scientists repeat the experiments to show that the explanation is reliable. Since the Earth's climate is beyond the reach of such experimentation, scientists instead run computer simulations of global climate. These models are always much simpler than the Earth's climate itself. In fact, it's theoretically impossible to create a "perfect" model of climate that includes all the detail of the real system. "The climate system is too complex," Mosley-Thompson said. "Even the most complex climate model doesn't get it right. And why is that? Because who writes the climate models? Humans. What is a climate model? It's a set of equations that describes what we think we know. If you're not cognizant of a particular phenomenon, then how can you incorporate it into a climate model?" The fact that different computer models often produce different forecasts doesn't offer much reassurance. For example, one model predicted that the Southeastern U.S. would become more jungle-like in the next century, while another model predicted the same region would become a dried-out savanna, according to Dr. John Christy, a professor of atmospheric science at the University of Alabama in Huntsville. However, scientists can establish some degree of confidence in their computer models by seeing if the model can accurately "predict" past climate patterns that are known to science. "Models in isolation may not be believable, but when ... a model can simulate a number of different observed climate responses, the results have more weight than mere calculation," Crowley said. "That still doesn't prove the point, but it minimizes the value of the argument, 'It's only a model.'" Ultimately, the verdict from science about the extent and cause of global climate change may not come from one particular study or observation. "I think from the viewpoint of thoughtful scientists, there's not going to be any single indicator, but rather there's going to be a concurrency of lots of indicators that's going to be convincing," said Dr. Tony Rosenbaum, a professor at the University of Florida who specializes in the politics of environmental issues. Above: Much of the energy coming from the Sun is in the form of short-wavelength radiation, which passes through the atmosphere. The Earth's surface re-radiates that energy as long-wavelength radiation -- such as infrared -- which is trapped by greenhouse gases, primarily water vapor, carbon dioxide and methane. While the "big picture" view of all the evidence from research around the world may offer scientists their best chance to understand global warming, no mathematical tools exist for combining all the data into a definitive, objective conclusion. Scientists' only option is to weigh the evidence and make a professional judgment. "There is a dichotomy between what is realistic and achievable, and what some people would like to hold as the ideal proof," Mosley-Thompson said. "I don't think this discussion lends itself to standard statistical testing," she continued. "Certainly you can test, statistically, the output of one climate model against another, a climate model against observation, an ice core data against observation -- but those are snippets .... What does it mean for reality? There's where the translation becomes difficult." When drawing a conclusion from the mosaic of evidence, different scientists will use different criteria, Crowley said. "I think that there are many scientists that are still locked into the idea that we have to prove something (about causes of climate change) beyond a reasonable doubt," Crowley said. "I don't think we necessarily have to do that. ... In a court of law you can convict based on a weight of evidence. ... That's the way you approach this type of problem." Because such conclusions are based on a scientist's professional judgment, disagreement is inevitable. "There is enormous room for differences of opinion among equally competent scientists of good will," Rosenbaum concluded. "There are always people -- and reasonable people -- who fall on both sides of the argument," agreed Abdalati. "And there are reasons for that. So the best we can hope for is a consensus." U.S. Environmental Protection Agency global warming homepage -- Includes facts and figures about global warming. Greenland's Receding Ice -- Information, images and animations about the discovery of thinning ice on Greenland by NASA scientists. Produced by NASA's Goddard Space Flight Center. IPCC (Intergovernmental Panel on Climate Change) -- The homepage of the international delegation of scientists charged with the task of investigating the evidence on climate change and producing reports for world leaders and the public. Contrary Thermometers -- A Science@NASA article discussing atmospheric temperature trends measured by satellites that conflict with the predicts of current computer climate models. The North Atlantic Oscillation -- An informational Web site from Columbia University.